Overeating is typical during the holiday season, but you can enjoy yourself more by eating less. About 2,300 holiday seasons ago, the Greek philosopher Epicurus summarised his life advice in a letter to his friend Menoeceus, in which he wrote that “a wise person does not simply choose the largest amount of food but the most pleasing food”. As we are entering another season of joyous excesses, we may wonder why we don’t heed Epicurus’ advice. Certainly, it is not because we are well-calibrated. My long-time co-author Brian Wansink and two of his colleagues recorded the daily weight of 2,924 people over the course of one year. They found an average weight gain in the days after Christmas of 0.6 kg in the United States and 0.8 kg in Germany. Six months later, half of this weight gain had still not been lost. We’re not actually happy to keep this extra weight. Interest in dieting, as shown in the Google search data above, skyrockets as soon as the season of indulgences turns into the season of New Year’s resolutions. But this interest is short-lived and diminishes as the year progresses, and 80% of diets fail, only to spike again with renewed eagerness on the next new year, in an endless cycle of hopefulness and forgetfulness. Why then do we go for the largest amount of food rather than the most pleasing? As is often the case, it is because we eat with our eyes, hearts and cultural norms, and neglect to pay attention to how we actually feel while we are eating. Over the past ten years, I have studied how people choose how much chocolate cake and other indulgent foods to eat. I found that people overwhelmingly focus on the fear of being hungry and value for money, which both lead to choosing large portions. Who has not felt cheated when buying an overpriced small cup of soda or popcorn during a holiday movie outing? Another important factor, which I discussed in an earlier INSEAD Knowledge article, is that our brain is very bad at product sizing and significantly underestimates the size of today’s jumbo food portions. In a series of studies conducted in the U.S. and France with Yann Cornil, who is now a professor at the University of British Columbia, we found that people neglect to take into account the role of pleasure when choosing between a small or large portion. Even more surprisingly, people get the relation between pleasure and (food) size completely wrong. For example, we asked 367 adults to predict how much they would enjoy increasing portions of chocolate brownie. Most of them correctly anticipated that the largest portions (350 kcal) would be too large, despite being actually smaller than a regular Starbucks brownie. However, in the chart below, the red line shows that they expected to enjoy eating a fair portion of brownie (210 kcal) more than eating only a third of it (70 kcal). It turns out that they were wrong. 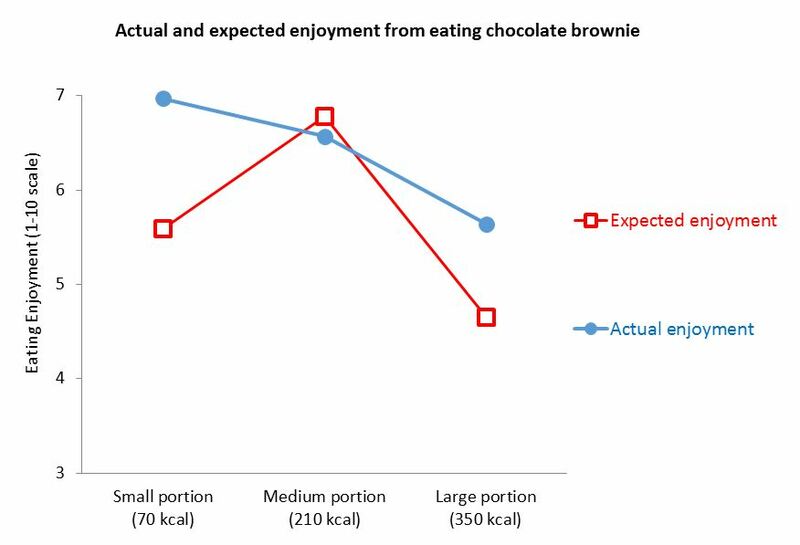 As the blue line shows, people who were given the mini-portion of brownie to eat reported a more satisfying experience than people who ate three times as much, who were in turn a lot more satisfied than those who were asked to eat five times as much. Why is eating pleasure not related to portion size? It turns out that the pleasure of eating is maximal for the first bite. Every additional bite, while still enjoyable, provides less pleasure than the preceding one. This is a universal phenomenon known as hedonic adaptation. What is less well known, and largely unanticipated, is that it is the last bite that determines our overall satisfaction with the food that we have just eaten. When people forget this and focus on hunger, value for money, or just don’t realize how large portions have become, they end up with portions that are too large from a pure pleasure standpoint. Assessing your risk: Are you an epicurean or a visceral eater? To determine how much, you or your loved ones, are at risk this holiday season, Cornil and I created a short self-assessment test based on your agreement with just seven statements. Are you an Epicurean Eater? 1. If I try, I can clearly and easily imagine the taste of many dishes. 2. My friends say that I am a foodie. 3. Cooking is a major form of art, similar to music or painting. 4. I like to discuss the taste of food with my friends. 5. There is a lot of beauty in food. 6. I can easily find the words to describe the taste of many foods. 7. More than other people, I value the look, the smell, the taste and the texture of food. This test determines whether, for you, the pleasure of eating comes from the aesthetic appreciation of the sensory and symbolic value of the food, or if it comes from the relief of eating impulses and hunger. We call the first type “epicurean eating pleasure” and the second “visceral eating pleasure”. Unlike epicurean pleasure, visceral pleasure is short-lived and can be measured by the responsiveness to external food cues such as the sight and smell of food, regardless of the internal state of hunger or satiety. We found that epicurean eaters are more likely to be women than men, but that epicurean eating is independent of age, income, education or body mass. In other words, epicurean eating is not restricted to the usual young, educated, and wealthy segments of the population. Best of all: epicurean eaters, who prefer smaller food portions, have a higher wellbeing than visceral eaters. So, whether you already are an epicurean eater, or whether you need to be nudged through sensory imagery, as I explained in another INSEAD Knowledge article, remember this holiday season that pleasure in food comes from appreciating its quality, not its quantity. After all, “‘Tis the season to be jolly,” not bloaty. Pierre Chandon is the L’Oréal Chaired Professor of Marketing, Innovation and Creativity at INSEAD in France and the Director of the INSEAD-Sorbonne University Behavioural Lab. So, You Think Your Customers Understand Percentages?